I was posting pictures recently and randomly came across this picture. I just couldn't resist sharing it with you. This is Lila at almost a year. Hilarious!! I didnt know Johnny was african american? I swear he is a white caucasian guy. awww..look at her..looks like she enjoyed her food..yummmy!!!! Sometimes I wish I could do that. 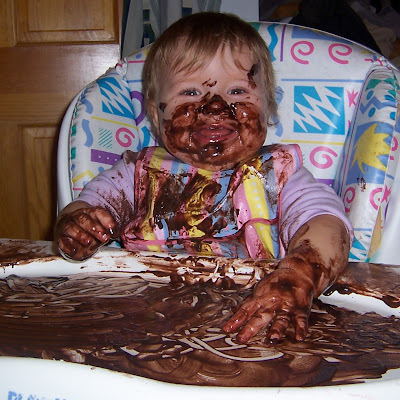 Mmm... chocolate. so funny, em, we just found out that scott's little bro landed a job in boston. they will be moving in the summer and are on the prowl for places to live, i told them we would get you guys in touch. his name is aaron and we will have him email you guys! Ah hahaha! She reminds me of that goopy chocolate guy from Candyland. very cute.